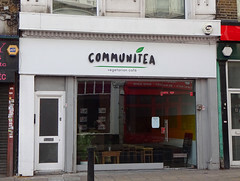 Vegetarian cafe and community space in South Norwood. It opened in May 2018. It's a small space, but has an open, uncluttered feel, aided by the floor-to-ceiling front window and plain-painted walls. Tables are reclaimed planks atop iron frames, and seating is a mix of upholstered stools and banquettes with colourful yellow plastic bucket seats. Succulents in small pots sit on the tables. The menu is entirely vegetarian with vegan options including vegan cakes and a choice of plant milks for coffee/tea. Order and pay at the counter, and they'll bring it to your table. Kake has visited several times now, most recently in January 2019. On a Monday lunchtime in August 2018 there was just one other customer when I arrived a little before 1pm, though a couple of others arrived while I was there. On a Monday morning in the same month I was the first customer at their opening time of 8am, with another turning up after an hour or so. Indian vocal music was playing on both visits, not too loud, and service was friendly and helpful. The "good sandwich" (£4.50 in August 2018) photo lived up to its name. The bread was a soft but robust wholemeal, and the filling was a well-balanced combination of hummus, avocado, and competently roasted vegetables. The vegetables consisted of aubergine, courgette, mushroom, red onion, and mixed sweet peppers, and had been marinated with things including scotch bonnet pepper, turmeric, and lemon before roasting, giving a good flavour and just a hint of chilli. The accompanying side salad included cucumber, tomato, and a fresh and varied selection of leaves, and was dressed with a light but flavourful dressing based on good quality olive oil and scattered with tangy sumac. A bagel with cream cheese and avocado (£2.80 in August 2018) photo was simple but well-prepared, with a good balance of ingredients and toasted just right. Iced cranberry and hibiscus tea (£1.80 in August 2018) was offered with a choice of sweetener (honey or sugar) or none. It was made properly — brewed strong then chilled and diluted with plenty of ice, and I was tempted to stay for a second one. No service charge was added, but there's a tip jar by the till. Child-friendliness: They have at least three IKEA Antilop highchairs with at least one tray, and there was a small baby in during our visit. No obvious nappy-changing facilities, though; there certainly isn't room in the toilet. Accessibility: No steps to get in or to the toilet, but the toilet cubicle is extremely small (to the point where larger people or those with longer legs might have trouble fitting in). Last visited by Kake, January 2019. Opening hours taken from sign in window, August 2018, amended via a Twitter post from September 2018. Last edited 2019-01-09 10:19:01 (version 6; diff). List all versions. Page last edited 2019-01-09 10:19:01 (version 6).